"The third album of Swedish wretched souls of dark metal LIFELOVER. 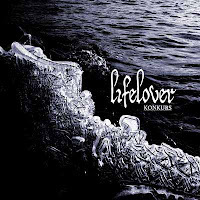 "Konkurs" is a fascinating album that mixes in a perfect solution both the traditional "depressive black metal" roots of the band and their well know more "avantgarde" (somebody says "bizarre"...) elements. Be prepared for a masterpiece. An album that will not be embraced by indifference at all..... as it is simply not possible to remain indifferent to this music."